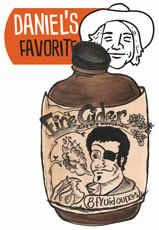 Fire Cider Vinegar for sale. Buy online at Zingerman's Mail Order. Gourmet Gifts. Food Gifts. Daniel Ackerman is a service star at Zingerman's Mail Order. Open the cap, and the first whiff of this ochre-colored vinegar will ignite your senses from the soles of your feet to your medulla oblongata (whatever it is, it will be ignited.) After collecting your blown-off socks from the other side of the room, you’ll have a moment to examine the bottle and catch your breath. Its brown paper resemblance to an old-timey concoction is no mistake, and while you won’t find a triple X on the label, Fire Cider Vinegar comes from a long, North-Eastern tradition of mixing vinegars with various fruits, vegetables, peppers, and honey to create a down-home cure-all that would be taken to freeze fevers and burn off colds. Muster some nerve, shake the bottle. Pour a small swig into a glass and knock it back, just as they would have 200 years ago. As your salivary glands fire on all cylinders, the vinegar will bless every inch of your insides it encounters on its way down. This is definitely hot stuff, and it has a richness and complexity of flavor that can be attributed to its various, organic ingredients. A bassline of ginger here and a guitar lick of horseradish there, fronted by the apple cider vinegar in leather pants and driven on the habanero pepper drumming its way to the dramatic conclusion: an inevitable, inescapable exclamation from your mouth and a single tear shed by your great-great-great-great-grandfather as he suddenly realizes how hearty his progeny will be. Prepared with the care of an aged Italian Balsamic, Fire Cider Vinegar is the nexus of delicacy and attitude. At home at a Texas barbeque or a Pennsylvanian picnic, pour it on some french fries or season your steak with it. Or, keep it on your shelf just in case you need to win a game of truth or dare.